As mob violence and political strife destroy Thailand's reputation as Southeast Asia's magic kingdom, the fortunes of Vietnam and Indonesia are rising. Thailand soldiers take up a position behind a burned-out bus, April 13, 2009, in Bangkok. Just a few days before mobs in Thailand forced the humiliating collapse of an Asian summit and the hasty evacuation from a Thai beach resort of a host of important regional leaders, the people of Indonesia voted, mostly peacefully across more than 10,000 islands, for a new parliament. This week, as an embattled Thai prime minister had to call in armed troops to restore order in Bangkok, the president of Indonesia was at work negotiating political coalitions in Jakarta. Is Southeast Asia turning upside down? While Thailand may not be on the road to perennial ungovernability, and Indonesia still has a long way to go to recover from the decades of Suharto’s dictatorship, there is at this moment in Jakarta more hope of peace and prosperity in the years ahead than Bangkok can promise. And Vietnam, despite its problems with corruption and a sclerotic bureaucracy, is another stable, rising power in the region increasingly able to challenge Thailand on several fronts. Both Indonesia and Vietnam share most of Thailand’s development plusses: high literacy, steady income growth, oil and gas resources, relatively strong agricultural sectors and developed export markets–though exports have taken a hit during this financial turndown. Culturally, the Indonesians and Vietnamese have much to offer; in the arts and design they surpass the Thais. In tourism, which is how most Westerners know the region, the Indonesians and Vietnamese can now rival the Thais in sophisticated hotels, palm trees, flowers, good beaches and even massages. A couple of years ago Vietnam built an expansive new international terminal at Tan Son Nhat airport in Ho Chi Minh City, which handled 13 million passengers last year. The government now plans to open a huge new hub, Long Thanh International Airport, northeast of the Saigon area, nearly equidistant to the booming seacoast oil town of Vung Tau. There is already speculation that between the new Vietnamese hub, which will handle 20 million passengers, and the gold-standard Changi airport in Singapore, Thailand will find it hard to compete as a crossroads for business and leisure travel in Asia. Whatever the economic and political future of Southeast Asia ultimately turns out to be, it seems evident that the region is in transformation, and Thailand no longer stands out as the magic kingdom. Across the world governments are issuing warnings or cautions against travel to Thailand, a deterrent with a long shelf life. Investment ratings are also slipping. While it is too soon to calculate the total losses of this winter high season, which was just getting under way when a mob closed the country’s main international airport last November, the Bangkok Post reported this week that tourist cancellations have been huge and about 200,000 people are expected to lose their jobs in that industry alone. A decline in tourism is only intensified by the global recession. Thailand’s political chaos has complex origins. This is something of a class war, but without ideology. The “red shirts” who have been on a rampage over the last week are not leftists but a ragtag assortment of devotees of an ousted populist prime minister, Thaksin Shinawatra, an ex-policeman and a communications billionaire who bought his way into politics. There is an urban-rural split, as the now self-exiled Thaksin (who talks of “revolution” in conference calls to his supporters) has harnessed to his voting advantage. He is worshipped in the countryside, where people feel cheated out of Bangkok’s affluence. On the other side of the political battlefield are the “yellow shirts,” drawn from the urban middle class with backing from members of the royal family–yellow is its signature color. This was the force that sent its legions to shut down Bangkok’s Suvarnabhumi International Airport last autumn to force the resignation of an elected government close to Thaksin. The yellow shirts have now reaped what they sowed, as the red shirts create havoc and undermine the current prime minister, Abhisit Vejjeijva. Rural-urban divides and ethnic or religious tensions are close to the surface almost everywhere in Southeast Asia. The Philippines, the only Christian country in the region, battles Muslim rebels. Burma is little more than a collection of ethnicities held down by military repression. Singapore, a city-state with no hinterland, keeps the peace through social engineering and the ruling party’s political monopoly. Malaysia, which maintains an uneasy balance among Malay, Chinese and Tamil populations, has just entered a period of political uncertainty with the swearing in of a prime minister, Najib Razak, who is burdened with a weakening economy, accusations of past corruption in defense contracts and persistent rumors that he was implicated in the murder of a woman who had been the lover of a close friend. Cambodia is in the hands of a boorish strongman, Hun Sen, who threatens to shut down a United Nations-backed tribunal to judge the surviving leaders of the Khmer Rouge, and allows corrupt politicians and businesses to confiscate the lands of the rural poor. 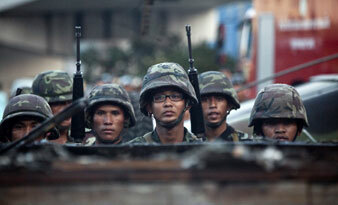 Laos holds a heavy hand over its tribal and ethnic minorities. In Muslim-majority Indonesia, President Susilo Bambang Yudhoyono is striving to hold together a peace agreement with separatists in Aceh on the northern tip of Sumatra, while also confronting perpetual unrest more than 3,000 miles away in Papua province, which shares the island of New Guinea with the independent nation of Papua New Guinea. Politically, however, Indonesia has found in Yudhoyono a popular and moderate leader who has brought stability to the country–with a population of 233 million, larger than Thailand (62 million) and Vietnam (84 million) combined–without relying on the military. Investors have taken notice. In the first six months of last year, before high energy prices and a global financial crisis kicked in, foreign direct investment rose 164 percent, according to the government. Geothermal energy is being exploited on an industrial scale. Steady progress has been made against Islamic militancy in the world’s most populous Muslim nation. For now at least, all this makes Indonesia a country to watch.